Here at the Starlit View Log cabin enjoy the breathe taking views; see for over 25 miles down into the valley with the majestic mountains all around. You are truly at a unique spot in the Blue Ridge Mountains. Hike to the nearby waterfall only minutes from the cabin on the Shenandoah National Park. Here you are as one with nature. 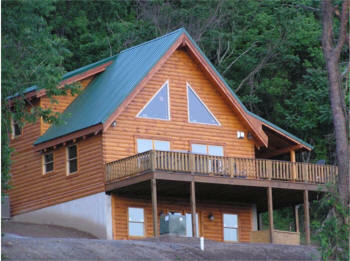 At night, you have never seen so many stars like you will here at the Starlit View Log cabin. Sit on the deck taking in the night breeze and see if you can count all the stars. After a day of hiking, relax in the awesome hot tub. It has its own waterfall, 78 jets, LED lights, and even a radio and built-in CD player with pop-up speakers. Grill out on the great gas grill while overlooking the views. If it happens to rain while you are here, you are in luck, sit on the covered porch and listen to the rain coming down on the metal roof just like your grandmother did years ago. Inside the cabin lounge around on our comfy furniture or catch a nap on one of our queen sized pillow top beds. The cabin has 2 bedrooms and 2 baths. In the corner of the master bedroom there is a 2 person Jacuzzi tub for those romantic evenings. Need to cook a big meal, no problem in this well laid out top of the line kitchen. It has all cookware, dishware, utensils, and pots and pans. It also features hickory cabinets, stainless steel appliances with dishwasher, and granite counter tops. The great room ceiling soars to 24 feet with exposed beams. Sunlight floods in with the abundance of windows. You get the feeling that you are outdoors or that you are in a tree house. The rock fireplace is the main focal point in the great room; it is over 10 feet tall. Cozy up to it on those cool evenings, making the cabin a very romantic experience. Rest assure the cabins are clean. We clean them ourselves. We are a small owner of vacation cabins and we take pride in keeping them in shape. Whether you have a romantic weekend in mind or just need to getaway and relax, then the Starlit Log cabin is for you.